After a long cold winter, many people begin their spring cleaning. Spring is also the time when new plants and mushrooms begin to grow and when people start preparing and planting vegetable and flower gardens. The arrival of warmer weather means children playing outdoors and they may be more difficult to supervise. Many household chemicals are used in spring cleaning including bleaches, disinfectants, floor and tile cleaners, and glass cleaners. Many are potentially dangerous if ingested or splashed onto skin or into the eyes. It is very important not to mix bleach, or products containing bleach, with any other household cleaners as a chemical reaction can release toxic gases. While spring cleaning never leave a cleaning product open and unattended. Read the product label and use according to the manufacturers directions. Ensure cleaning products are stored up high and out of childrens reach and keep them in their original containers with original labels. With spring many people brighten up the paint work around their houses. Some painting products such as oil based paints, paint thinners, and turpentine can be harmful. Old homes may have lead based paint, and sanding can lead to inhalation of lead dust by family members. Ensure children are supervised when painting, keep all products in their original containers, and put any chemicals straight back in their place of storage after use. If you are renovating and old home, check the paint is not lead-based. Your Local Health protection Unit can test the paint and provide advice for safe renovation. Spring means lots of growth in the garden, planting and preparing. Poisonous plants, fertilisers, herbicides, insecticides and fuel for lawn-mowers present common hazards to children, pets, and wildlife. It is important to utilise adequate safety methods when storing, applying or disposing of garden products and their containers. Wear protective clothing when using garden sprays and do not apply them on windy days. Be careful to ensure childrens toys, sandboxes, bikes or pet food dishes are not sprayed. Fertilisers can irritate the skin and stomach if ingested. After applying fertiliser, make sure the ground is watered thoroughly before letting children on the area. Otherwise, ensure children and pets stay off the area for a few days or until it rains. Spring is a good time to learn the names of new and existing plants in your garden, so that the correct information can be given if poisoning should occur. Any wild mushroom growing in the garden should be regarded as poisonous and should be removed as they sprout. 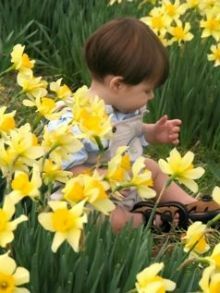 Children should be encouraged to enjoy the plants in the garden without eating them. It is advisable to have plants that are poisonous out of reach of children. If petrol is ingested, or petrol vapours inhaled, it can make you very sick. When swallowed, it is very easy for petrol to go down the wrong way which can cause lung problems. Petrol can also damage the eyes if not treated quickly. At spring events glow sticks/bangles/necklaces are popular with children. Sometimes these products break and children will get the liquid on their skin, in their eyes or mouth. It is not very harmful but may cause stinging and burning to the eyes and skin and if swallowed it may cause an upset stomach. Guy Fawkes Night is a spring event where poisoning can occur. Certain fireworks contain chlorates, which can cause the blood to be unable to carry oxygen. If eaten, these fireworks can be very dangerous in children. Ensure all used fireworks are collected and disposed of responsibly. In spring many people develop hay fever (sneezing, runny nose and itching eyes) from the pollen of all the new flowers. People suffering from hay fever use medications such as antihistamines to control these symptoms. Where possible, request child-resistant caps for medicines and keep them out of reach of children.